If you have not been reading my blog, perhaps you may want to read Part 1 and Part 2 first before proceeding to Part 3. Now let's continue from where I left off. 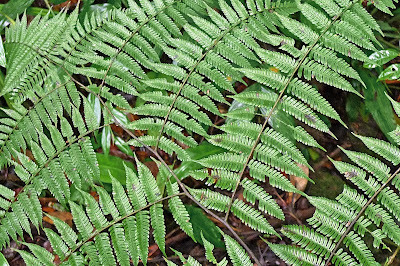 The sound of a child crying in the middle of the Kinabalu forests spooked me. It was not the first time I experienced strange encounters in the forest so I guess this would not be my last. Oh gosh, this reminded me too much of The Blair Witch Project! Anyway, I walked towards the direction of the crying sound. It got louder and louder and I knew I was quite near to the source, yet I could see no one. Then all of a sudden, the crying stopped. In the silence I could hear my own heartbeat. Then a voice spoke, "Hello? Who's this?" I walked a few steps and came out into a clearing. A teenage girl was talking on her handphone. Beside her, were two adults who were most probably her parents. They saw me and smiled. I walked up to them and asked if they heard a child crying a minute ago. The two adults looked at each other and then shaking their heads, said no. The girl was still busy talking on her handphone. "That's weird!" I said. "I heard a child crying near here. How come you did not hear it?" "Are you sure it's the sound of a child crying? It could be an animal." The man spoke. "I'm sure it's a child. It sounded human." I said, starting to freak out. "We didn't hear anyone crying" the woman offered. "Or maybe... it's haunted here." "Oh please..." I was really freaking out. Then, all of a sudden, the teenage girl laughed. We all looked at her. "Haha! I think it's my handphone." She said in between laughter. "It's my ring tone!" She demonstrated the ring tone on her phone. The sound of a child crying came out loud and clear. I was like, oh my God! It was a mixture of relief and embarrassment. I told her, "For God's sake, stop using that ring tone here! It scared the hell out of me!" Her parents then joined in the laughter. The mother told me she was so used to the ring tone she did not even realised the sound I heard came from her daughter's phone. The girl apologised and then showed me her other unique ring tones. One was a child crying "Help me! Help me!" Another was a child saying "Hello? Hello?" The ring tones may sound cute but I told her she had better not use any of those ring tones or she may just lead someone to a heart attack. Anyway, we had a good laugh about it and talked for a while. They were from Sandakan just coming for a visit to Kinabalu Park to escape the hot weather. They told me they like coming here. Walking along these steps I soon reached the Botanical Garden. 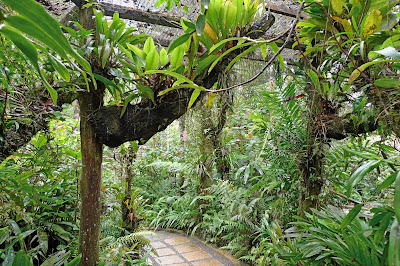 Here's the entrance to Botanical Garden. Passed by lots of different types of plants but did not really take a lot of photos. 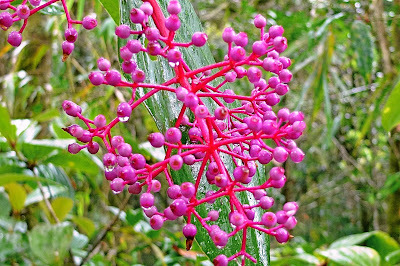 What do you call these plants on the tree? I seriously don't remember. There were names displayed near each plant but I forgot to took photos of them! Aha! But I remember this one. 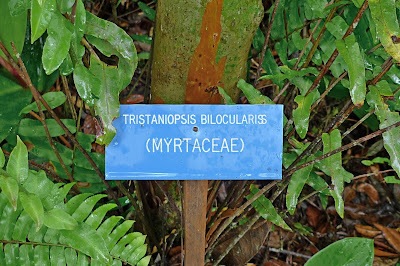 It's called Tristaniopsis Bilocularis from the Myrtaceae family. Am I smart or what! Hmm, bilocularis....sounds like 'binoculars' to me! LOL! Actually, I am not that smart. I took a photo of the name displayed on the signboard. Haha! After I left the Botanical Gardens, I sighted this. 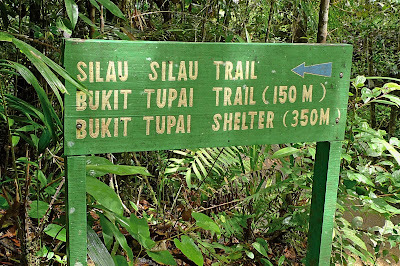 I was tempted to walk the Silau Silau trail, but looking at my watch, I knew there was just not enough time. I guess it's time to leave Kinabalu Park if I really do not want to be stranded here! So I walked back to Liwagu Suites. From there, I walked back the way I came earlier in the morning. When I reached the Headquarters at the ticketing entrance, it was already past 3.30pm. It suddenly started to rain again. This time heavily. I ran into the Reception Office of the Sutera Sanctuary Lodges just in time to escape the rain. There were a few taxis waiting outside, but it would cost me about RM150 to go back KK unless I share with others. Or I could take the bus down the road past the ticketing entrance. It would only cost RM20. But the thought of walking down to the bus stop in the heavy rain deterred me. So I decided to wait for at least two other persons to share the taxi with me. But after waiting for half an hour, there was no one leaving the Park by taxi! There were people leaving in chartered vans or buses, but none by taxi. I was about to give up when a man came up to me and asked if I were going to KK town. I said yes and asked if he could take me. He told me he would be sending a British couple who had just completed their Mount Kinabalu climb to KK but they have chartered his 4 wheel drive for RM180. He asked me how much I was willing to pay. I told him I could easily take the bus for RM20. On hearing this, he laughed and said yes, I could take the bus but I may have to wait a long time as the bus would not stop for me if it was full! And the buses were usually full at this time, although I wouldn't know how true was that. He offered me RM40 but I thought it was too expensive, and negotiated. In the end, we settled for RM30. Wondered if I had struck a good deal! Or I was being cheated. In any case, he told me to pretend that I was just his friend taking a ride in his car if the British couple were to ask me. I have no problem with that! It would not be nice for the British couple to find out that I paid a mere RM30 while they paid RM180 to charter the whole car. Anyway, I later checked with Jenny of Lavender Lodge where I stayed and found that I had actually struck a good deal! That's good to hear. Haha! The drive down from Kinabalu Park was hair raising and adrenaline inducing to say the least. The driver drove very fast, in the rain and even in thick mists! He was almost always tailgating other cars in front and attempting to overtake them at every opportunity. I was sitting in the front passenger seat next to him and every time he braked, my right leg would automatically stepped onto an imaginary brake! I just prayed the car would not run off the edge of the cliff! While I was a little nervous sitting in the front, I noticed that the British couple at the back was fast asleep! Well, it's no wonder. I would have slept too after just returning from an exhausting climb up Mount Kinabalu! Despite the thrilling ride, I must say that the driver was very skillful and he really knew how to negotiate corners. He must be very familiar with the road seeing that he could drive so fast in those thick mists! And his car was very stable too. No wonder the British man had said "I like this car!" when he was getting into the car earlier at the Park. We reached KK in about 1 hour and 20 minutes. Not bad, as the average time quoted by travel brochures were close to 2 hours. After taking a bath and rested for some time, it was dinner time. I decided to try one of the restaurants below Lavender Lodge. I ordered a 'kon lou' duck mee which costs RM5. It was delicious! After dinner, I decided to visit the Night Market a few streets behind Lavender Lodge. Didn't buy anything and didn't take any pictures there. Too lazy, I guess! Haha! I also went to the Guardian Pharmacy nearby to purchase some important stuffs that I need for next day's trip. When I got back to the lodge, I was already worn out and ready to sleep! But not before taking my bath. No bumping into "Nicole Kidman" this time, unfortunately. Haha! But surprise! I could not sleep! I was tossing and turning in bed. I was thinking maybe I should just go downstairs to the lobby and use their computer to check on my blog to see if I received any comments from my readers. By the way, if you were to bring your laptop, you can surf the net in any of the rooms here as the lodge offers free wifi. Anyway, I decided against it. I have already promised myself I would not go online for the duration of this holidays, and I must keep to my promise. 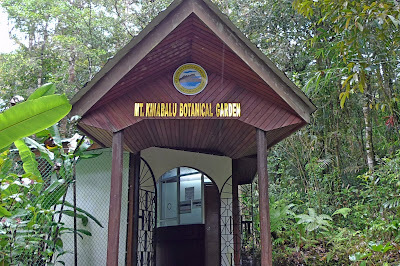 In the end, I just took out my camera and reviewed all the photos I took at the Kinabalu Park earlier in the day. 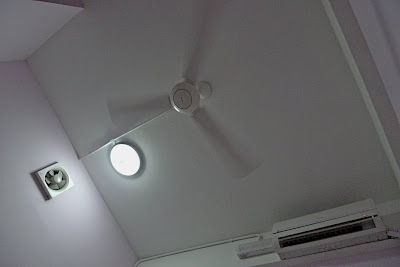 Lying down on my bed, I lazily snapped this photo. 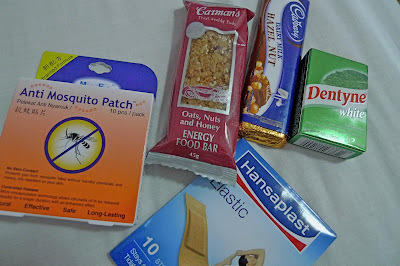 Oh, by the way, these were the stuffs I purchased at the Guardian pharmacy. A box of anti mosquito patch, a packet of Hansaplast, a Carman's energy food bar, a Cadbury chocolate bar and a box of Dentyne chewing gum. Based on these stuffs, where do you think I would be going the next day? Of course, not everything was really needed for the trip. I just included some of the items as red herrings to throw you off the right track. Haha! But I can assure you that the anti mosquito patch is a necessity. Oh, here's another important hint. 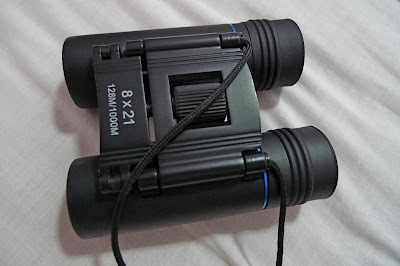 A binocular which I brought from home! This one is a must for the trip! That girl really shouldn't have used those ringtones, especially the crying for help one. It seems like this park is not quite accessible (via public transport) from KK huh? Darn it, I was freaked out reading the first few paragraphs about the crying child. LOL! I am the worlds biggest coward la. I agree with day dreamer, some people shouldn't use ringtones like that! You must be really scared with that crying...too bad for you foong! You adventure has gone pretty well,will check your next post. Hmm go bird watching? 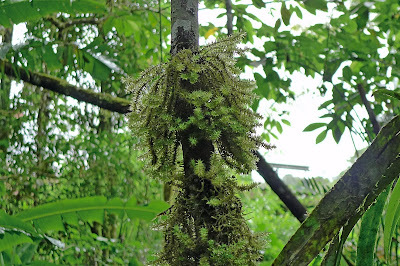 or Jungle trekking again. Whoever came up with those silly ring tones ought to be scolded nicely....for alarming people. Rightly so as anyone would have been scared silly..haha. The duck noodles looked very yummy. And wow..it cost RM150 for a taxi to take you to KK...that's exhorbitant! day-dreamer, yes no one should use this kind of ring tone! There is public transport eg. buses but according to the people in KK, it is tough to get onto a bus after 4pm at Kinabalu Park. mei teng, those ring tones should be banned! Haha! Yes, RM150 is really expensive, right? Maybe they are cashing in on the tourists. Even a taxi ride from PJ to Genting Highlands costs RM80 only! But then PJ to Genting takes only 45 mins. Kinabalu Park to KK takes 1 hour and a half. That's also one reason why I did not visit the Poring Hot Springs! The cab driver said he charge RM80 for a one way trip from Kinabalu HQ. Talking about taking advantage! Foong, you should have booked the ground tour prior to your trip so that it covers the main attractions in KK and help save on transport costs. Travelling on your own can be costly. Poring Hot Springs was a great visit...esp after scaling Mt KK. Rm30 for that ride back to KK is a steal!! I think if there was no other transport back, you would surely have forked out that RM150 just to get back instead of being stranded there. No? Yeah, that baby-crying ringtone can be quite scary and disturbing, esp in a deserted jungle setting. happysurfer, yes if there's no other transport, will have no choice but to pay RM150. Or maybe sleep for one night in that cosy sofa at Liwagu Suites for free. haha! lol if i were you and i heard some girl crying, i'll be freaked out too! 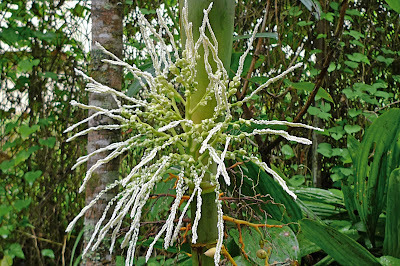 but LOL that girl.. using weird ringtones.. haha..
nice pictures of the plants/flowers you got here..
you next trip? erm... kuching? haha..
it's not only teens who are using those ringtones, I heard them a lot in the office and it is so unprofessional. Cute yes, but definitely not to be used in a forest/park/office and where it will cause alarm. See! You like KK's konlou mee... If you come to Sibu, you'd love out kampua too...or Kuching's kolo mee! Even nicer!!! lina, these ring tones are used in office too? Yes, so unprofessional! Oh, Zaini also like to tailgate? Then you have to always engage your imaginary brake when you sit in his car lah! Haha! borneo falcon, well according to the people there, the weather is always like that! the rain is very unpredictable because of the huge mist covering the mountain. You are lucky no need to stay a night at the park. hehe. RM40 sure cheaper than the room rate. There’s just so much pure greenery there. It’s really great to go relax. it must be quite a memorable adventure for you. Haha, who wouldn't be scared? 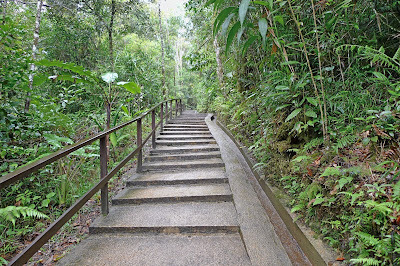 The drive down the Kinabalu park is indeed adrenaline surging! Strong advise not to sit at the front! All those plants...they looked like orchids. Is it? tekkaus, yes I think I should get those ring tones to play a prank on people! Haha! But I won't play it in the forest - I don't want to be responsible for people getting heart attacks! LOL! Yes, I think I've heard the word 'myrtacea' before in school before. Haha! The konlou looks yummy with the duck meat. It is 2 am , I am hungry lorr!